When I was a child, text features were always my favorite part of our social studies and science books. The long paragraphs just looked too long and too boring to read. I’d rather get my information is short quick bursts of words. As a teacher, I’ve found this is true with most children. They like the pictures, maps, diagrams, timelines, and captions. 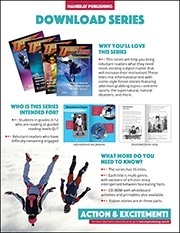 The Download series is written on a second- to third-grade reading level with a fourth- to ninth-grade interest level. They are aimed at struggling and reluctant readers. Book topics are of high interest to all children, especially boys. With titles like The Paranormal, Natural Disasters, Martial Arts, and BMX and Mountain Biking, what student could pass them up? Each book is primarily nonfiction, but includes a three-chapter fictional story that relates to the book topic. I recently used several books from the Download series with my third-, fourth-, and fifth-graders. I passed the copies out to some of my more reluctant readers and let them start exploring without any directions or specifications. After fifteen minutes, I asked them what they thought about the books. They immediately began showing me all of the new things they’d learned. Guess what! Every single “cool new thing” they learned was in a picture or caption—proof that kids love text features! I asked them to specifically show me what they liked about the books. Some liked the fictional story inside the nonfiction text, some said all the captions, and others said they liked the pictures and maps. I had to pry these books out of their hands when they left the library so I could use them with my next class. The third-grade Common Core State Standards specifically mention text features. Third-graders are expected to use text features and search tools to locate information relevant to a given topic efficiently (ELA CCSS R.I. 3.5). While there are many ways to teach text features, I will share one lesson with you that I have taught. First, I wanted to highlight the differences between a text with text features and one without. I gave out a typed paragraph of nonfiction information. This could be on any topic you choose. The students were told to read the information and make as many notes as they could in about five minutes. Then, I gave them the same information in a two-page spread, but with pictures, maps, captions, labels, and sidebars. I gave them the same directions as with the first passage. After examining both texts, we talked about the similarities and differences, and discussed which of the formats held their attention longer, which was easier to glean information from, etc. The consensus was that the passage with the text features was better. The next part of the activity, which they loved, was to take a passage that had no text features and completely redo it to include as many types of text features as they wanted. They LOVED this! We pulled pictures off of the Internet, and used markers and colored pencils. Some students used the books from the Download series as inspiration for how to arrange their text features. They truly enjoyed this learning experience! How have you taught text features in your classroom? I would love for you to share your lesson ideas in the comment section below! To learn more about the Download series, you can click here to visit our website, or click the series highlights images below to download an information sheet with key features.